Take a bit of help this morning from the freezer. 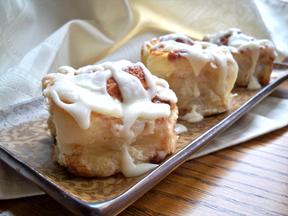 Using frozen bread rolls makes life a little easier and still makes a delicious fresh baked cinnamon roll. 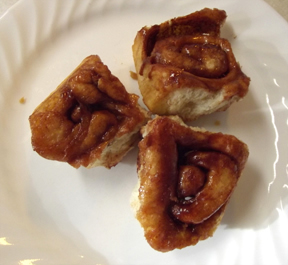 Brown sugar, butter and cinnamon make a sticky caramel that covers these rolls. Using non-stick pan, arrange rolls in single layer. (For round pan about 6, for oblong pan about 12). Leave space in between rolls. 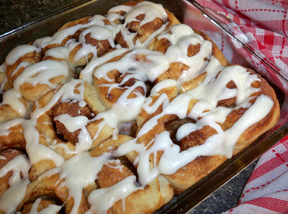 If not using a good non-stick pan, be sure to grease the bottom with butter before placing rolls in the pan. 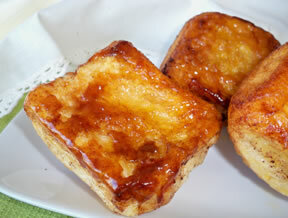 Melt margarine and brown sugar together and pour over rolls. Generously shake cinnamon over rolls. Bake at 325° for 30 minutes. Cool in pan for at least 10 minutes. "These rolls were OK and they definitely were easy. It was kind of like eating a bun with a little cinnamon caramel coating on one side. It didn't indicate in the recipe to grease the bottom of the pan but I should have. They stuck to the pan and I had to pry them out with a metal spatula."